When I first looked over this recipe, I figured it would end up being just a glorified bean dip. But oh no, it's SO much more. The flavors in this "hummus" are amazing and intense...and it turns out to be quite addictive. What's even better is that it's ridiculously easy to make, requiring few ingredients, most of which you probably already have at home. If not, the list is cheap. The recipe can be easily doubled (or tripled! ), because trust me, you'll want a lot of this on hand at your next shindig or potluck. 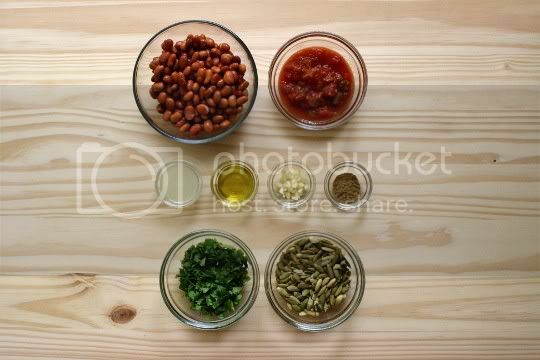 Simply add a can of pinto beans (rinsed and drained), your favorite salsa (I used a medium variety, which was just enough heat), lime juice, olive oil, fresh garlic, and cumin to a food processor, and puree until smooth. Scoop that into a bowl, then add toasted pumpkin seeds and fresh chopped cilantro, and stir until combined. It's that simple! 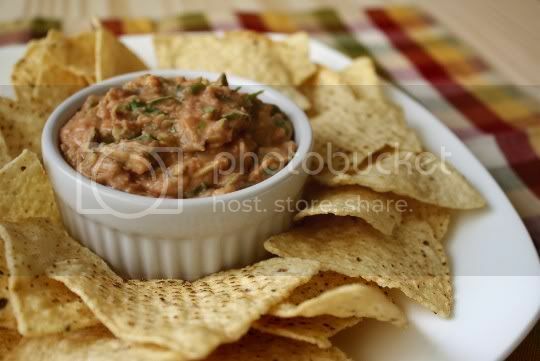 The consistency is that of thick refried beans, but the pumpkin seeds add some chewy, crunchy texture. The salsa and lime juice provide tanginess, and the cumin gives it an almost Mediterranean smoky flavor. In fact, I think this is what brings everything together and gives it that unmistakable taste. And the cilantro, mmm mmm mmm. I love cilantro so much that I might consider adding even more, but there's enough in here to give it that guacamole-like flair. 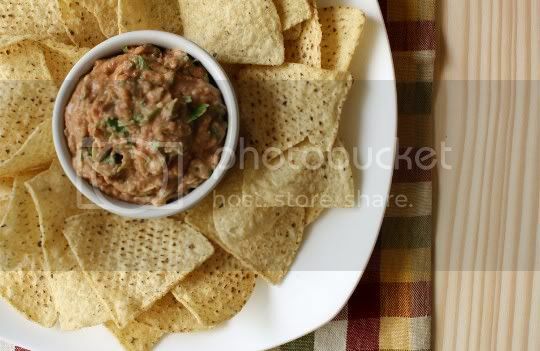 Certainly an interesting twist on plain old bean dip! Make again? Helllls yeah! I can't wait to have people over and serve this as an appetizer! It might also be interesting to use different kinds of salsa: chipotle, roasted, verde, etc.